The Ontario government will spend around $27 billion on nuclear power between now and 2025 in a bid to keep the lights on in the province. If history is any indicator, the nuke plans will be characterized by inefficiencies, unanticipated delays,and massive cost overruns, but will at least ensure that future generations have access to a secure supply of radioactive waste. This morning I appeared on a radio show called The Green Majority on CIUT, the University of Toronto radio station, to discuss the Security and Prosperity Partnership (SPP). Listen to the audio of my interview here. Representatives from the Conservative party declined to participate in the interview. This photo, taken two days ago by the MODIS on NASA’s Aqua satellite, is striking. It never would have occurred to me that wildfires could burn so strongly and become so widespread as to be visible in this much detail from space. 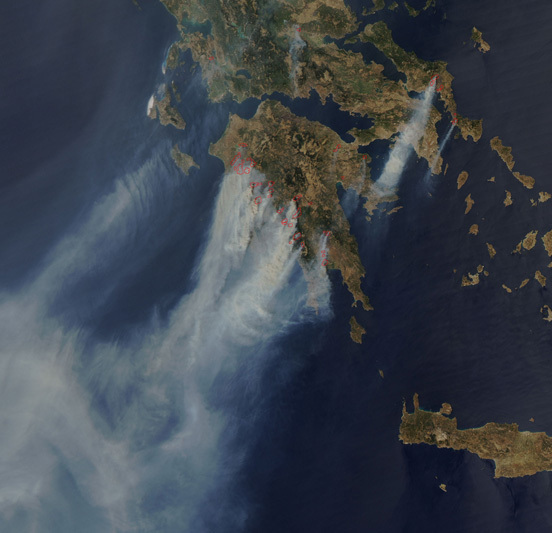 The fires in Greece, which we are told were deliberately set, have been fueled by an unusually dry and windy climate. There’s news this morning that the Greek government is taking criticism for not acting soon enough after finding out there was a problem. Now, after at least 63 people have already died, 21 countries are lending their firefighting abilities in an international effort to stop the burning. I’ve had Billy Joel stuck in my head all day.